If you have always been fascinated by the magic and the mystery of Tarot, you are going to love this program. 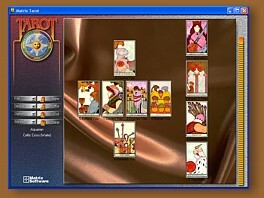 Our Professional Tarot software is the first program to truly capture the sense and feel of a "hands on" reading. Perhaps the most captivating aspect of Tarot is the reader's tools - the cards. This software includes ten of the decks most often chosen by professionals. The onscreen graphics are beautiful. 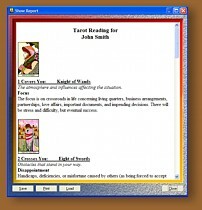 If you are experienced with Tarot, you will appreciate the realism of the software and the many features that allow you to explore the answers the cards hold for you. The program is easy to use. A short tutorial included with the software will have you up and running in minutes. Interpretations were prepared by internationally recognized Tarot expert, and author of Tarot Made Easy, Nancy Garen. Have you heard what others are saying about our Tarot program?